1. Make the filling: In a large skillet, heat 4 tablespoons of the olive oil over medium heat. Add diced onions, season with salt and pepper and sauté until softened. Mix in the chopped garlic, thyme and rosemary. A few handfuls at a time, stir in the chard and, using tongs to toss, cook with the onion mixture until all the greens are soft, about 10 minutes. Turn off the heat and use a slotted spoon to transfer chard mixture to a large bowl. Stir in tomatoes, egg and matzo pieces, mixing well. You will have at least 5 cups cooked filling. 2. Heat oven to 375 degrees. Lay the meat flat on a clean work surface, season the top with salt and pepper and spread a thin layer of the filling (about half) evenly over the surface of the meat, leaving a 1-inch border. Reserve and refrigerate the remaining stuffing. Tightly roll the meat and secure it with kitchen twine, making a knot every 1 1/2 inches and tucking the meat in to enclose the ends. Season the outside of the roll with salt and pepper. 3. Add the remaining olive oil to the skillet, turn the heat to medium-high and brown the stuffed veal on all sides. Transfer to a large roasting pan with a lid. (If your skillet isn’t large enough, brown veal directly in the roasting pan, laid over 2 burners of your stovetop.) To the pan where you browned the meat, add wine and simmer for about a minute, scraping up any browned bits from the bottom of the pan. Spoon liquid over the meat. 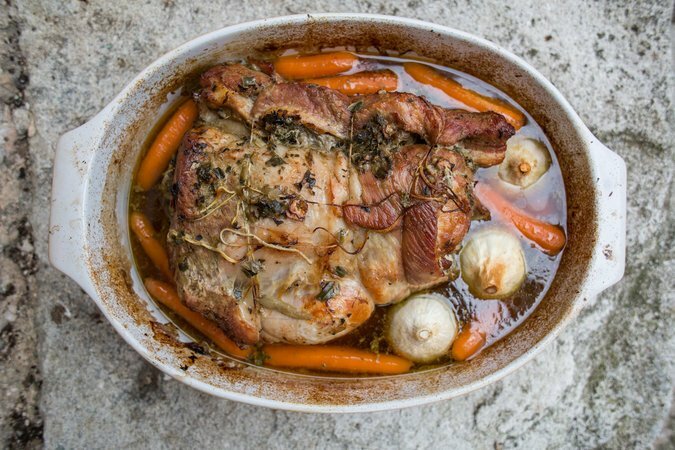 Scatter the carrots, large onion pieces and whole garlic cloves around the veal, place the bones, and pour in about 8 cups of water or enough to come halfway up the meat. 4. Reduce oven to 325 degrees and cook, covered, 2 1/2 hours, basting every 20 minutes or so, until veal is cooked through and tender, 165 degrees on a meat thermometer. 5. Remove the meat from the pan, set aside to cool, then refrigerate overnight. Strain the sauce, reserving the carrots and discarding the bones and the onions. Refrigerate sauce and carrots. 7. Just before serving, reheat in a 350-degree oven, covered with foil, about 20 minutes or until heated through. Serve in individual portions or on a platter, with a little chard stuffing and carrots on top of each slice for color, and drizzled with some of the braising liquid. Tip: You can use breast of lamb instead of veal.